DirAnalyze is the PUP that uses misleading techniques to prevent removal. Use Reimage to locate malicious components and get rid of them faster than with uninstall instructions. A full system scan blocks virus reappearance and prevents traffic to malicious domains. 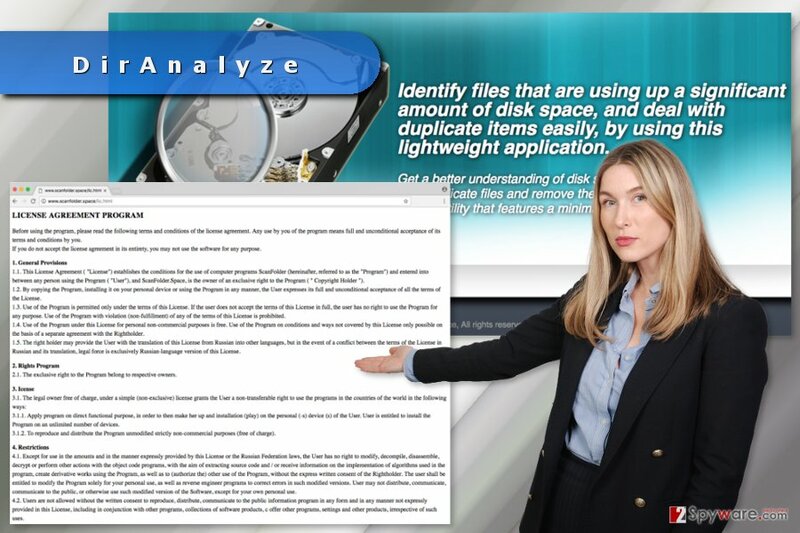 DirAnalyze is a disk optimization software that is known as a potentially unwanted program (PUP). It does not have an official download site, might spread bundled with freeware and after the infiltration establishes a connection with remote websites. 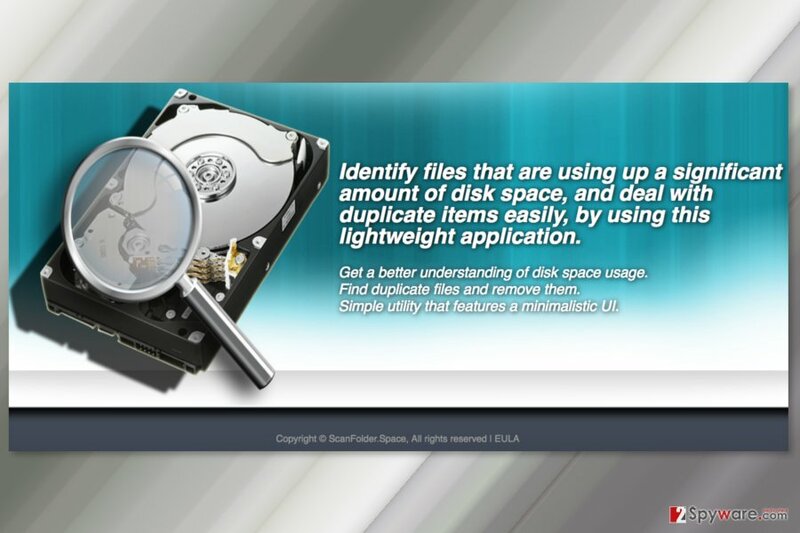 “Get a better understanding of disk space usage. Find duplicate files and remove them. The same page also includes the Licence Agreement. However, this document does not tell who are the developers. But it’s clear that the same policy belongs to ScanFolder and ScanFolder.Space programs. The paper itself looks like an ordinary EULA that does not contain any specific information about the DirAnalyze. However, security researchers find several negative and suspicious aspects of the so-called DirAnalyze virus. The program is launched from the sdiskfinder.exe file. On the affected computer it might collect particular data, and after connecting to remote Russian sites, it transfers the aggregated data. It’s unknown what information it might track, so, this tool is very suspicious. The program itself barely functions as promised on the site. It cannot optimize the disk space or delete duplicated files. All it can do is to display the system scan results and promote the paid version of the program. Undoubtedly, you should not obtain the paid DirAnalyze version. The payment system is suspicious. What is more, you do not know the developers. Thus, you might just disclose private details to unknown people and waste your money. If you are offered to download the paid program or suffer from undesired pop-ups, you should obtain reputable security program and remove DirAnalyze from the system. We suggest automatic elimination option because it’s the easiest way to get rid of all files and components that might be related to the program. It’s a tricky program that may have installed suspicious components to the system that might be hard to eliminate manually. Thus, we suggest DirAnalyze removal complete with Reimage. DirAnalyze is a bogus PC optimization tool that might hijack the device after the installation of freeware. As you already know, this program does not have an official website that offers a direct download link. Thus, there’s no doubt that DirAnalyze hijack occurs during the installation of freeware or shareware. The program is supposed to spread as an optional component in software packages. The biggest PUP’s distribution has been noticed in Russia; however, the program’s interface is written in English, so it might spread in English-speaking countries as well. The hijack might occur when a user downloads a program under Quick/Recommended settings that do not openly inform about additional third-party components. In order to avoid their silent installation, users have to install freeware under Advanced/Custom settings and unmark all pre-selected third-party entries. Before telling you the way how to remove DirAnalyze, we want to point out that it’s NOT a virus. This suspicious PC optimization tool is just a potentially unwanted program that cannot cause huge damage to the device. However, its operation, such as data transmission, is suspicious. Thus, you should get rid of it. Go to Start and access Control Panel. Then in Control Panel, choose Add or Remove Programs or Uninstall a Program option. In the appeared list of installed programs, you should find DirAnalyze. Double click on it and choose Uninstall option. You should also look up for other suspicious programs and remove them as well. If system scans continue or you want to speed up DirAnalyze removal, you should opt for the automatic elimination method which is held using anti-malware software. We recommend for this task Reimage, Malwarebytes MalwarebytesCombo Cleaner or Plumbytes Anti-MalwareMalwarebytes Malwarebytes. ^ Disk optimizer. Webopedia. Online Tech Dictionary for IT Professionals. ^ Erez Zukerman. 4 Ways To Read & Understand An End User License Agreement (EULA) More Easily. MakeUseOf. The website about technology. ^ Bedynet. Bedynet. Russian website about malware, PUPs and online security. This entry was posted on 2017-07-28 at 01:36 and is filed under System tools, Viruses. You can quickly scan the QR code with your mobile device and have DirAnalyze manual removal instructions right in your pocket. How did you remove DirAnalyze?